A marvelous gift from Mother Nature, terpenes are made by every plant and even some insects such as the bark beetle and the black carpet beetle. Aroma, flavor, healing, food, medicine – terpenes are simply everywhere! Popular essential oils include lavender, sage, eucalyptus, and cannabis. Aromatherapy has been shown to reduce menstrual or menopausal problems, circulatory issues, headaches, anxiety, depression, and nausea. Aromatherapy can be further classified as cosmetic, massage, medical, olfactory, or psycho, based on the type of essential oil used and the desired effect. The oils can be applied using various topical products, through inhalation, or as part of massage therapy. Terpenes can be inhaled through a diffuser, a spray, oil droplets or a steam bath. Inhaling terpenes stimulates the olfactory system. Once the terpenes reach our brains from our noses through the olfactory system, they begin to interact with the limbic system which controls our emotions. Besides the pleasing fragrance of some terpenes, there is an overall positive effect on the heart rate, blood pressure, breathing, and stress. When terpenes are applied topically, the terpenes of essential oils are mixed with massage oil or some other skin care product. Aromatherapy massage using terpenes increases circulation and also aids in the absorption of the massage oil. The cannabis plant contains at least 140 different types of terpenes. Cannabis essential oil colored green and highly volatile. It is extracted by steam distillation from cannabis flowers and upper leaves. Since this oil is so powerful, very small amounts can create the desired effects. Therefore, cannabis essential oil not only benefits the mind and body but also is an economical and natural way to maintain our well-being. The nine primary terpenes of cannabis aromatherapy are alpha-bisabolol, alpha-pinene, beta-pinene, borneol, caryophyllene, humulene, limonene, linalool, and myrcene. It’s the unique and diverse combination of these terpenes that creates characteristic aromas and flavors for a specific cannabis variety, in addition to adding distinct health benefits. For example, pinene functions as a decongestant, clearing sinuses and increasing airflow to the lungs, while limonene has powerful antioxidant and anti-inflammatory properties. Terpenes and cannabinoids, like tetrahydrocannabinol (THC) and cannabidiol (CBD), work together to maximize therapeutic benefits and to create the targeted result. While doing so, some terpenes like alpha-pinene and beta-pinene lessen the intoxicating effects of THC. THC binds to receptors which are concentrated most heavily in the areas of the brain where psychoactive effects take place, namely, the brain stem (controls sleeping, breathing and heart rate), limbic system (controls emotions), and cerebral cortex (the thinking center). The terpene beta-caryophyllene can even bind to CB2 receptors and modify their chemical output. Borneol widens lung capillaries, thus helping cannabis compounds enter the bloodstream quicker for healing. The AromaChill relaxation system, hand-held and huggable, with a soft mask to hold to your nose, is a new direct delivery aromatherapy method which delivers chilled and fragrant terpenes while enabling mindful breathing. This revolutionary system is highly effective in relieving stress and insomnia while protecting the terpenes from environmental overheating and oxidation. 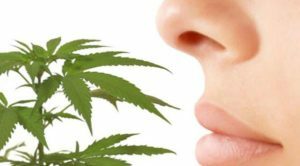 The nasal inhalation of chilled air can draw highly relaxing terpenes into the nose from cannabis essential oil, other essential oils, as well as herbs and flowers present in the system’s small aroma chamber. The delivery of slightly chilled air is possible by storing this system in the refrigerator or freezer, thus maximizing the relaxing effect of terpenes. The recipient’s mind is able to deeply sense the chilled, fragrant air passing through the nose into the lungs. This air is warmed in the lungs and then exhaled through the mouth. 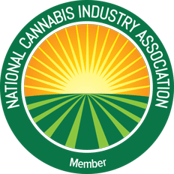 This entry was posted in Cannabis Industry, Cannabis Topics and tagged aromatherapy, cannabis terpenes, marijuana terpenes, medical cannabis.